A 7.8 magnitude earthquake occurred in the Gorkha region of Nepal on 29 April 2015. 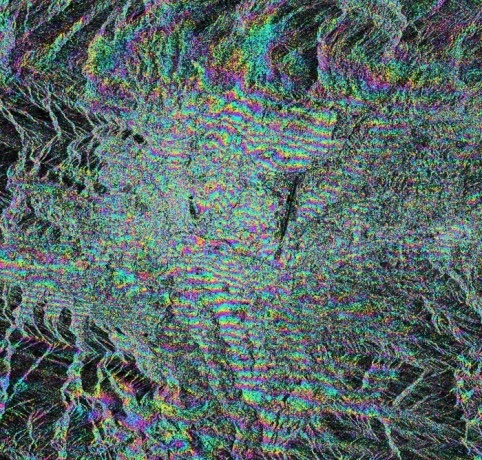 A ground displacement map based on data gathered from the Sentinel-1A satellite is shown below. In this image, yellow areas represent uplift and the blue areas represent subsidence. Surface ruptures are places in the ground where the quake has cracked the rock all the way up to the surface. 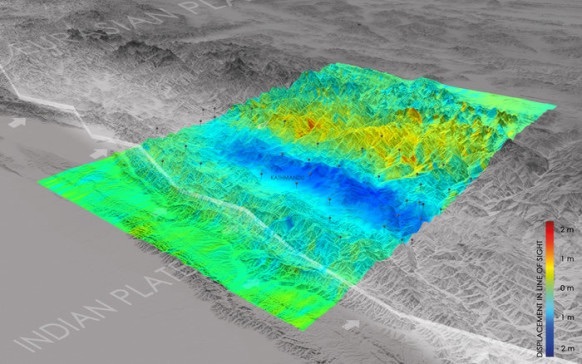 Preliminary satellite data indicate that the Nepal earthquake did not cause any new surface ruptures. Interferometric analysis of before and after satellite data can be used to measure more subtle changes in the vertical height of the ground along the fault line. 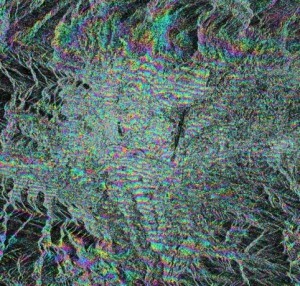 Preliminary results from an interferometric analysis by the European Space Agency (ESA), generated from satellite scans of Nepal from April 17 and 29, 2015, is shown in the following image. Each fringe of color represents 2.8 cm of ground deformation. Areas immediately south of the fault line, like Kathmandu, sank more than a meter into the ground as a result of the quake. Directly north of the fault slip, further into the Himalayas, the ground was lifted up by about a half meter, indicated by the yellow in the first image, above. Imagine the difficulty of gathering such data from direct physical examination of the affected area.